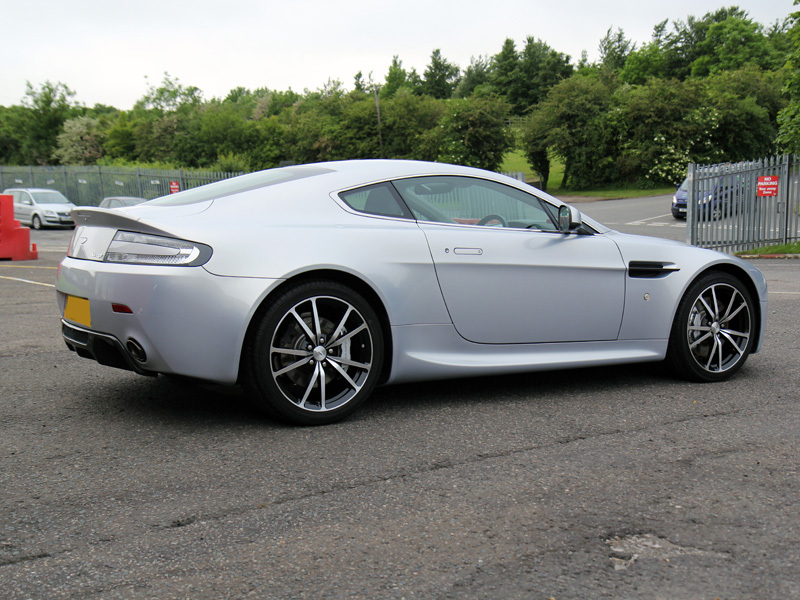 Aston Martin does a great job of taking successful race cars and translating them into road cars that can be enjoyed by the enthusiast. With its roots in GT4 racers, the ‘N’ designation signifies this beast has been tried and tested on the famous (or infamous, depending on your point of view) Nürburgring whilst the 420 marks the power output. 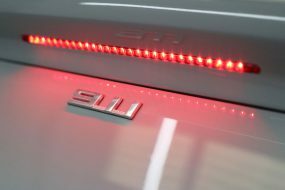 The successor to the N400, the N420 hits the road with a Sports Pack suspension as standard and a motorsport-inspired exhaust system guaranteed to set pulses racing. 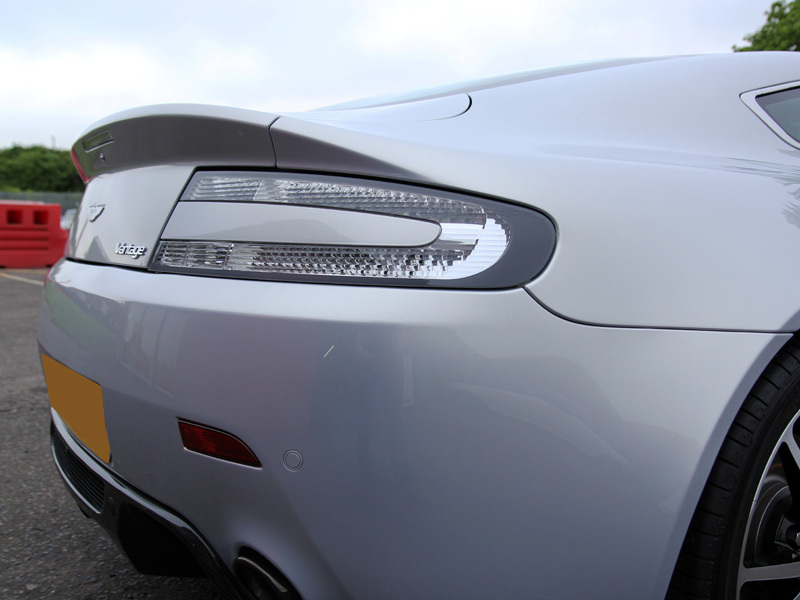 Plenty of carbon fibre, including the splitter, side strakes and diffuser saves the N420 27kg over the standard V8 Vantage. The 10-spoke diamond turned alloy wheels with a piano black finish, black mesh vents and ‘Graphitic’ tailpipe finishers add suitably racy touches to the overall look. 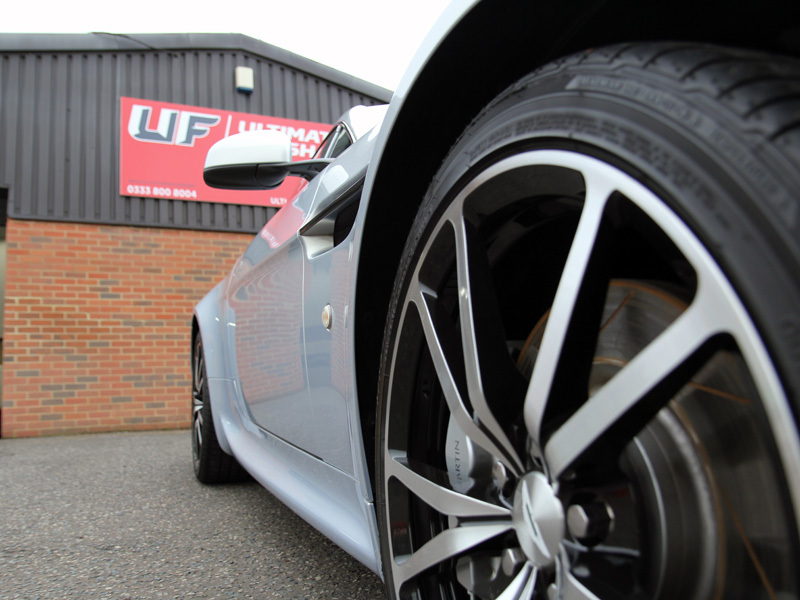 This 2011 ‘Lightning Silver’ Vantage N420 arrived at UF’s Brands Hatch based Detailing Studio for a Gloss Enhancement Treatment to remove the wash-induced swirls that were dulling the metallic paintwork. Additionally, buffer trails left over from poor machine polishing techniques were evident on the driver’s door. 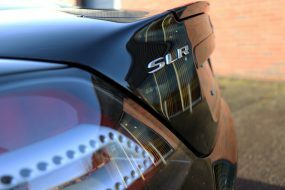 In preparation for the detailing required to correct and refine the paintwork back to its former glory, the car was first thoroughly decontaminated. 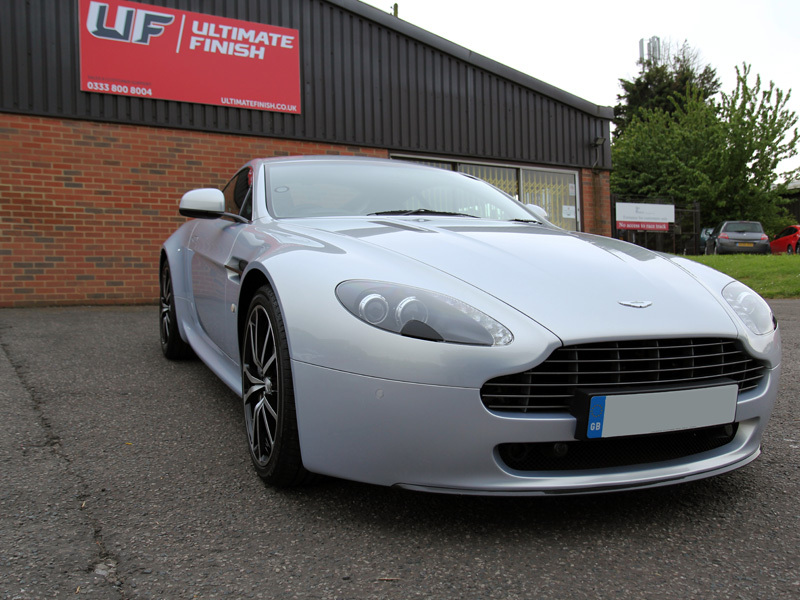 After treatment for iron contamination and being fully degreased using Bilt-Hamber Surfex HD, the Vantage was pre-cleaned using Ultimate Snow Foam to remove larger particles of dirt and grit from the surface. After rinsing, Ultimate Snow Foam was re-applied, this time used as a lubricant for a Flexipads Clay Mitt. This mitt acts the way a detailing clay would, shearing away any protruding contamination bonded to the surface. 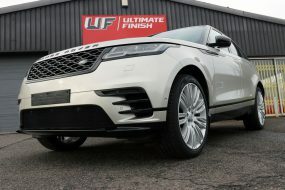 The car was then rinsed again before being washed using separate wash and rinse buckets armed with Grit Guards, an Ulti-Mitt Double Sided Merino Wash Mitt and Gtechniq G-Wash high foaming car shampoo. After the suds were washed away, an Aqua Gleam De-Ionising Water Filter was connected to the hose to give a final, pure water rinse. Using UF Ultra-Soft Microfibre Drying Towels, the Vantage was then dried and brought into the studio and raised on a pneumatic ramp to allow the paintwork to be closely inspected under high-intensity lighting. 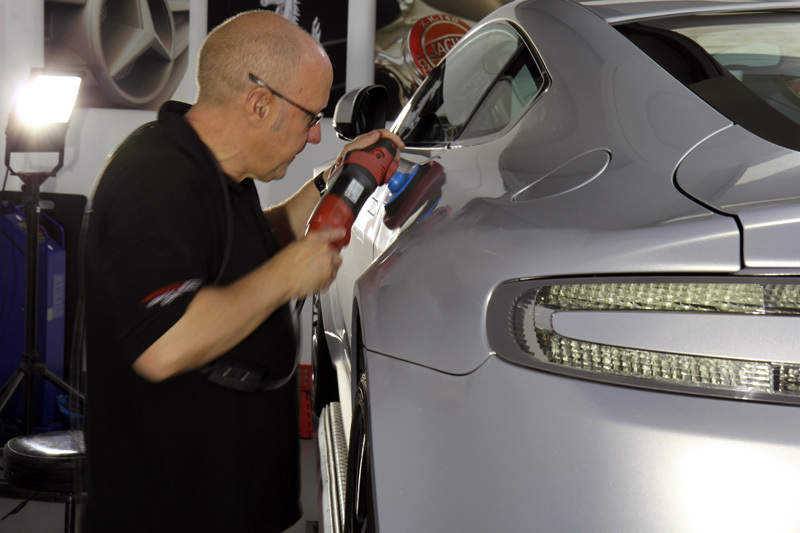 To tackle the marks a FLEX PE14-2 rotary machine polisher was used, with Menzerna Medium Cut Polish 2200 (previously PO234), a compound ideal for scratch resistant clearcoats. Menzerna 2200 is designed for use with a medium or hard polishing pad and in this instance, the Kamikaze Collection Banzai Dynamics Polishing Pad was selected. 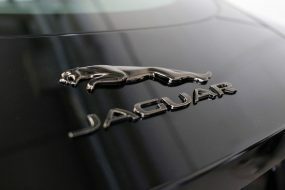 Once the paintwork had been enhanced, it was then prepared using Gtechniq Panel Wipe to remove residues of polish, ensuring the surface is clean and ready for the sealant. 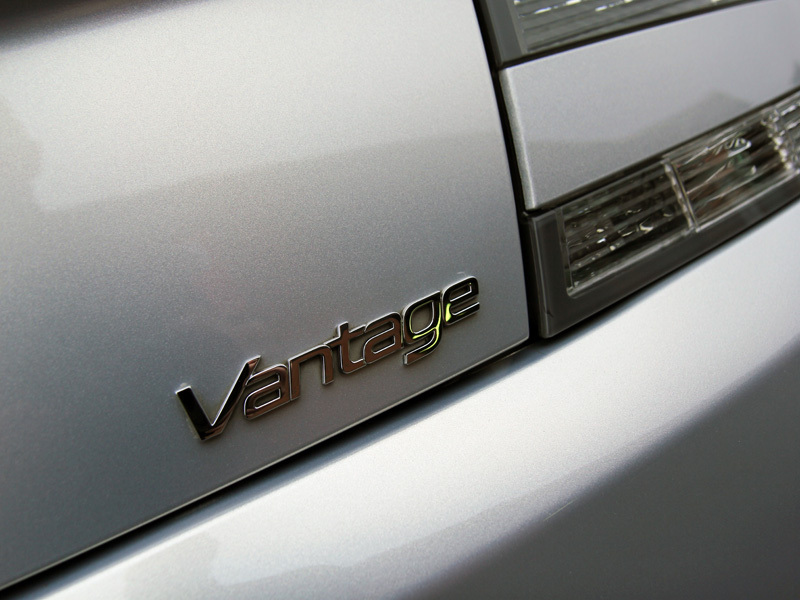 The owner of the Vantage had requested a protective sealant with significant durability and protection from wash swirls. Crystal Serum is an innovative nano-ceramic sealant that cures as two separate layers. The under layer is softer, giving it flexibility while the top layer cures extremely hard. The combined effect is a swirl resistant finish, helping to minimise the chances of incurring marks in the surface. The finish is also virtually impervious to extremes of pH and Gtechniq guarantees the performance of Crystal Serum for seven years. 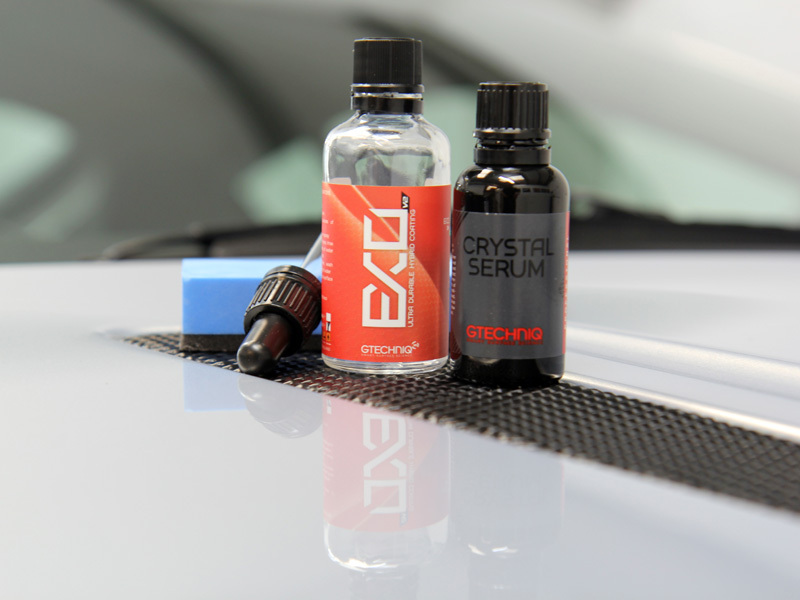 To enhance the hydrophobic properties, Gtechniq EXO v2 is applied over the top of Crystal Serum, (CS Black) helping to keep the car looking cleaner between washes and also to add an improved level of gloss. 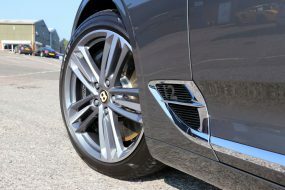 For the wheels, Gtechniq C5 Alloy Wheel Armour was used. 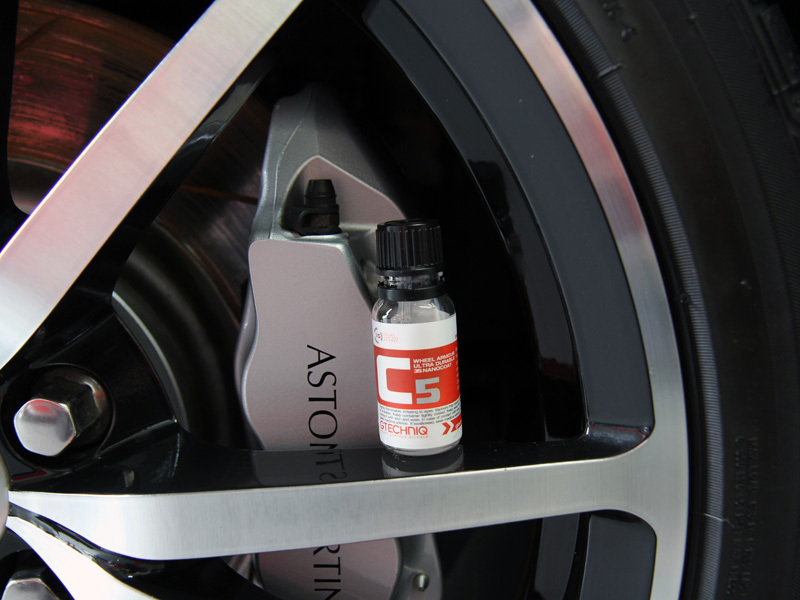 Like Crystal Serum, this nano sealant forms chemical bonds with the substrate and provides a durable, heat resistant coating that repels dirt and helps inhibit brake dust particles from bonding with the alloy. 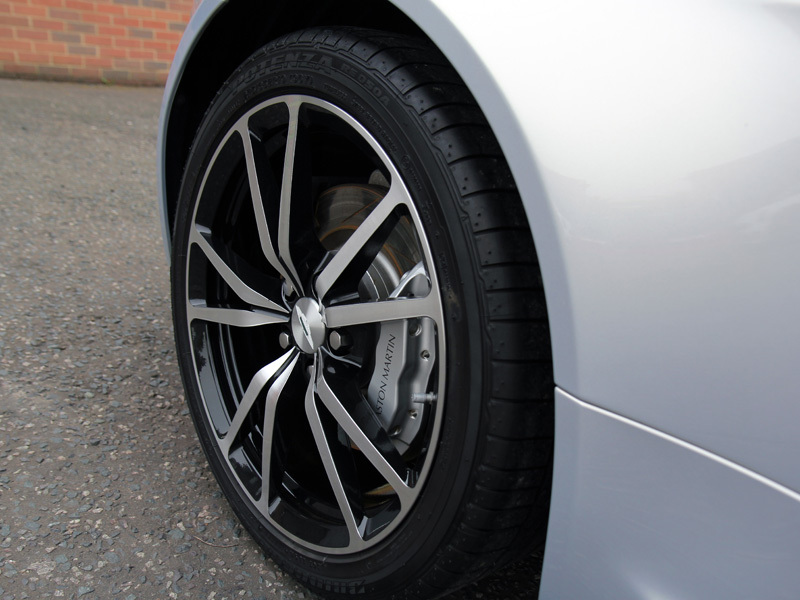 Once the wheels were coated, the tyres were treated with Gtechniq T2 Tyre Dressing, for a natural satin finish. The glass was cleaned and then sealed using Gtechniq G1 ClearVision Smart Glass. This coating repels rainwater, causing it to form beads on contact with the treated surface. These beads of water are easily blown away while driving, even at relatively low speeds. 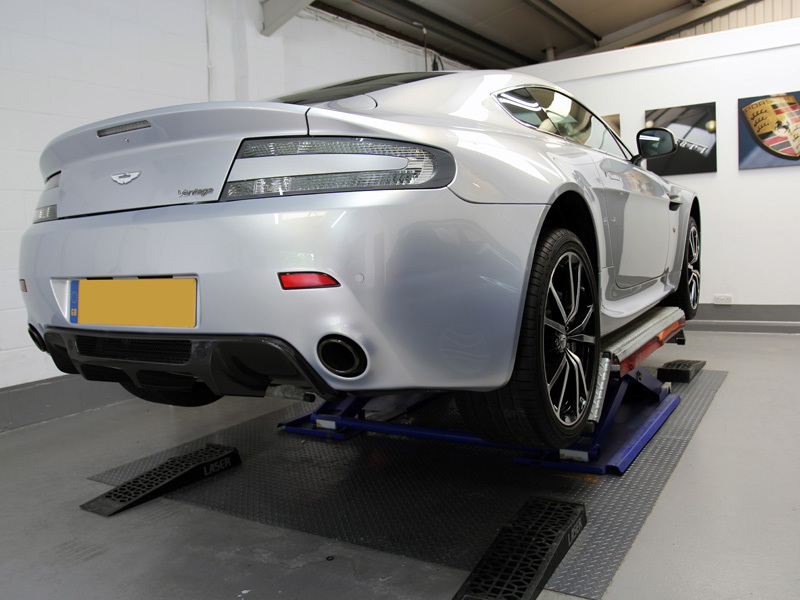 Gloss enhanced and now fully protected, the Aston Martin V8 Vantage N420 was ready to race again!